2017 Update: The Coldwater Kid Top Fuel team races into 2017 with great new marketing partners in Arizona Air Compressor and FS Curtis. This partnership resulted in great results at the team's first outing of the season. 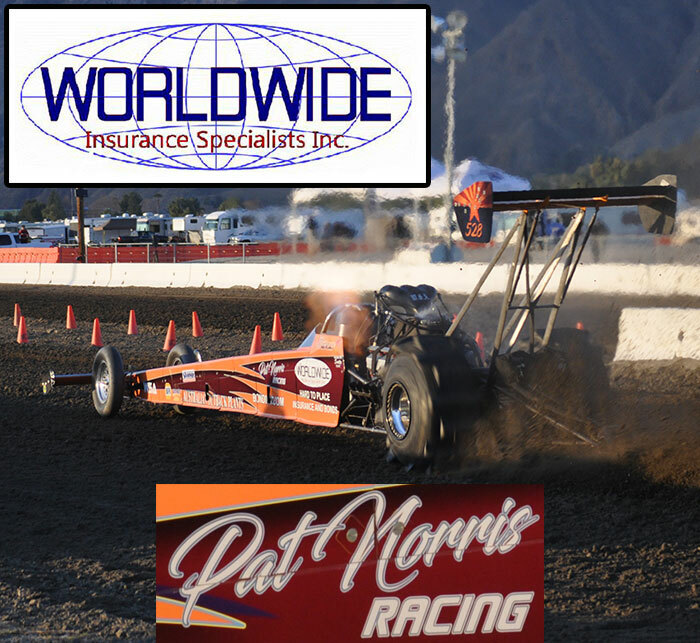 Matthew Ludlow piloted the John Aleman-tuned Dragster to the team's Personal Best ET of 2.27-seconds over the 300' of dirt at the Soboba Casino in San Jacinto, CA. This combination shows a ton of promise as the team heads to Race 2 of the 2017 Southern California Sand Drag Association series. This team is full of top notch individuals including Matthew Ludlow (Driver), Dwight & Marie Ludlow (Car Owners), John Aleman (Crew Chief), and Jim Green / Charlie Starns (Crew). 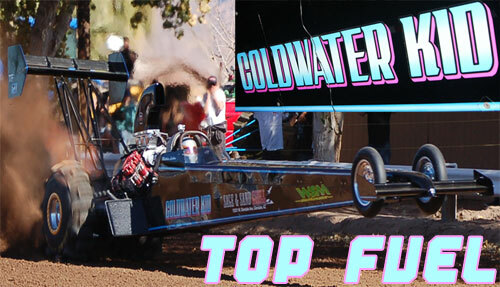 Look for the Coldwater Kid Top Fuel team to be right in the mix as the 2017 sand drag racing season continues. Arizona Air Compressor: Your business depends on the reliability of the equipment you use. 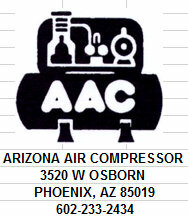 Discover high quality air compressor sales, maintenance and repair at Arizona Air Compressor in Phoenix, Arizona. You'll find top quality products including industrial supplies and motors at low prices. We specialize in commercial and industrial air compressor service and sales. We provide on-site training seminars for your technicians and provide emergency repair services so malfunctioning equipment doesn't slow your business down. Arizona Air Compressor is a small company with big values. We've been in business since 1986 and understand the old-fashioned value of a handshake. Our business is founded on the principals of honesty, integrity and innovation. FS-Curtis: FS-Curtis is a world-wide provider of compressed air solutions headquartered in St. Louis, Missouri. A company history that dates back more than 150 years is a company history that, to us, is just the beginning. FS-Curtis is committed to offering a world-class portfolio of products. Through the dependability of our people and our quality-focused manufacturing, FS-Curtis will continue to be the most trusted and dependable name in compressed air serving even more markets through our ever-growing global presence. For more information, visit www.fscurtis.com. Or download the FS-Curtis Promo Brochure (PDF File). 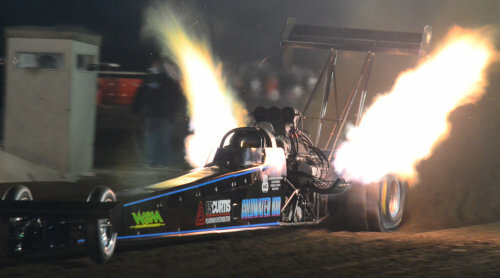 Matthew Ludlow with a great launch in the Coldwater Kid Top Fuel Dragster at the SCSDA Season Opener in San Jacinto, CA. 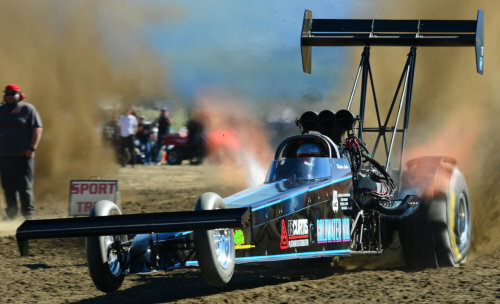 The Sage and Sand Grill-backed Coldwater Kid Top Fuel team is heading into their seventh season of competition in sand drag racing. 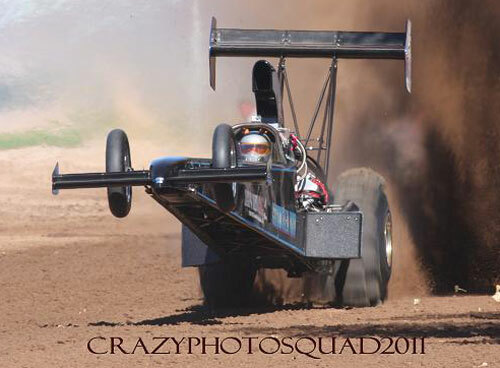 The Family operated team from Litchfield Park, Arizona is owned by Dwight Ludlow with his son Matthew piloting the 300” nitro-burning Top Fueler. They are three-time Dome Valley Top Fuel Shootout champions (2009, 2011, and 2013). At the 2013 Dome Valley March Madness event, Matthew piloted the Hemi-powered Fueler to his career best pass with a sizzling 2.301/162MPH blast. They also recorded the Quickest Run for Top Fuel in the 2011 race season with a 2.308/158MPH run in the final round of that season's Dome Valley Top Fuel Shootout. This team has also been featured on SPEED Channel's "Lucas Oil On The Edge" & Fox Sports Net's "Race Freaks" TV Shows during the Inaugural Dirt 300 Nitro Nationals in Albuquerque, NM. At this event, the Coldwater Kid team earned a solid runner-up finish. 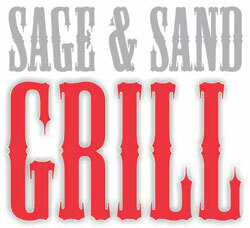 The Coldwater Kid team would like to thank their major sponsor Sage and Sand Grill in Glendale, AZ. Sage and Sand offers a warm and casual atmosphere that is ideal for both sports fans and non-sports fans alike. It is a place where you can relax and enjoy an indoor or outdoor atmosphere to unwind with a cocktail or beer. Sand Volleyball, Basketball, Horseshoes, Darts, Pool, Shuffleboard, Karaoke, Live Music, Backyard BBQ, and more are among the activities available at Sage and Sand. For more info, visit Sage and Sand online at http://www.sageandsandgrill.com/. A great team surrounds the Coldwater Kid Top Fuel operation led by crew chief John Aleman. John also serves as the crew chief for the Cadzow Motorsports/WSM Auctioneers Top Fuel team, where both teams work hand in hand sharing info. The rest of the crew consists of Pat Sardina (Assistant Crew Chief), Jim Green (Crew), and Dwight Ludlow (Car Owner/Crew). Crew: John Aleman (Crew Chief), Jim Green (Crew), and Charlie Starns (Crew). Sponsors: Arizona Air Compressor, FS-Curtis, & WSM Auctioneers. 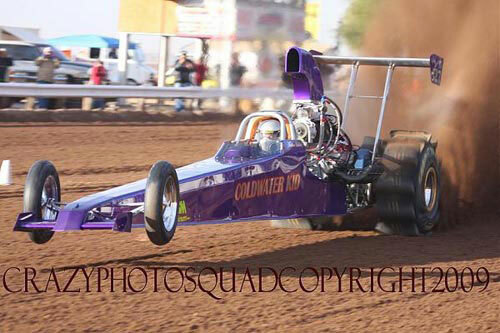 This is a great launch shot of the Coldwater Kid Top Fueler launching at Dome Valley Raceway in Wellton, AZ. The Coldwater Kid team debuted their current 300" chassis in late 2010 and tuner John Aleman got some great data to tune from in 2011. Look for this team to be a major contender in 2012. The original Coldwater Kid Top Fuel car ventured well into the 2.3 second zone and won the Inaugural Dome Valley Top Fuel Shootout before being replaced by the team's current chassis.